ABERDEEN PROVING GROUNDS, Md. (May 07, 2010) -- The Army's Program Executive Office Soldier showcased some of its products May 5 at the Aberdeen Test Center here. Among those products were the XM153 Common Remotely Operated Weapon Station, the M2 .50 Caliber Machine Gun with M2E2 Quick Change Barrel Kit, the lighter weight M240L Medium Range Machine Gun, and the XM25 Counter Defilade Target Engagement System. A technician fires an M-16 at Aberdeen Proving Grounds in Maryland. 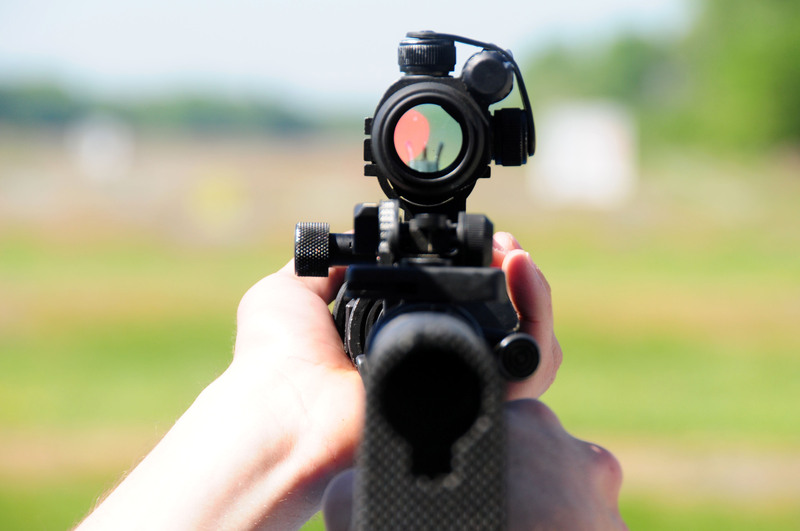 The scope attached to the weapon has laser assisted targeting, as seen here through the optics. Lt. Col. Christopher Lehner, program manager for individual Soldier weapons at PEO Soldier, demonstrated the XM25 airburst weapon. The system launches 25mm programmable rounds which can explode over a target. If the Soldier "wants to get that round in the window ... what's he's able to do with the high explosive round is he's able to laser designate the building and the round will then fly through the window and explode inside the room," Lehner said. Aboard the XM25 is a laser rangefinder that can measure the distance to the target and place an adjusted aim point on a targeting screen. The system then allows Soldiers to choose to over-shoot the measured distance so the round will explode inside the building. The targeting computer programs the round to explode at the designated distance. The system allows Soldiers to hit targets they cannot see, because they are hiding behind walls, inside buildings or behind natural obstructions. Special operations forces will be the first units to use the XM25. Maj. Sean Murray, assistant product manager for individual weapons, discussed the M26 Modular Accessory Shotgun, which can be held individually or mounted under an M4. It allows for the firing of lethal, less-than-lethal or door-breaching rounds. The rifle's door-breaching capability was demonstrated on a free-standing framed door set up on the test range. With one shot, the lock mechanism was destroyed and the door was easily kicked open. Murray said the optimal distance for performing a door-breech operation is about three inches. The shotgun has a slider tip at the end that pulls out to the correct distance, so Soldiers don't have to guess. It's expected the first units will be equipped with the M26 this summer. The M320 Grenade Launcher attaches to the bottom of an M4 or M16, and can also be configured as a stand-alone weapon. It attaches or detaches from a weapon with no special tools required and includes a side-loading breach for longer 40mm low-velocity projectiles. The system also includes a day/night sight and a handheld laser rangefinder for the grenadier. The system is designed as a replacement for the M203. "The 203 has been a great workhorse for us, but in the M320, we've got a more reliable, more accurate and safer weapon system," Murray said. The M320 was fielded to units in 2009. On the M240L 7.62 Medium Range Machine Gun, Murray said the system is one of the best in the world. It's "the most reliable machine gun on the battlefield -- bar none -- nobody else in the world has a machine gun just like this," he said. The weapon is about five pounds less than the 240B, which the Army has fielded for 20 years now. But the M240L has "no decrease in reliability or maintainability," Murray said. The M240L has a titanium receiver, instead of steel, and also sits on the M192 Lightweight Ground Mount -- a new tripod that weighs seven pounds less than the previous tripod for the weapon. "As part of our initiative we're trying to get the Soldier's load lightened up and in this case we've shaved off 12 or 13 pounds from the original configuration," he said. Aboard the CROWS -- a remotely controlled weapons system that mounts above a vehicle -- is the addition of a "green laser" that can temporarily blind targets, said Maj. Michael Pottratz, assistant product manager for crew-served weapons. "It's a non-lethal hailing device, that crosses cultural and language barriers on the battle field, enabling Soldiers to stop or halt or warn civilian on the battlefield," he said. The system can be used at checkpoints to warn civilians to stop, for instance. "It temporarily disrupts the individual's vision and safely warns them." Having the light shined into your eyes is "like looking at the sun for just a couple of seconds," said Pottratz, who has been exposed to the light before. Pottratz also explained improvements to the M2 Machine Gun -- the original design has been used by the Army since 1933. Additions to the weapon include the M2E2 Quick Change Barrel Kit which allows Soldiers to remove a hot barrel quickly and not have to readjust and set headspace and timing. A demonstration showed that when fitted with the kit, the barrel on the M2 could be changed in a little over 18 seconds. "During the heat of battle, the difference between these weapons systems is night and day," Pottratz said. Thermal weapons sights, including the AN/PAS-13(V)1 Light Weapon Thermal Sight, the AN/PAS-13(V)2 Medium Weapon Thermal Sight, and the AN/PAS-13(V)3 Heavy Weapon Thermal Sight were also displayed. The sights serve weapons from the M-16 rifle to the M249 Squad Automatic Weapon and the M2 machine gun. Matthew Hunter, an operation specialist with PEO Soldier Sensors and Lasers, talked about the capabilities of the sights, saying they provide targeting indicators for Soldiers and visual aids to help identify the distance of objects through the sight -- for instance, lines indicate how tall a five-foot man would appear or how large a ten-foot tank would be though the sight. The sights also display information about the weapon they are attached to, and indicate remaining battery life. Hunter said the sights fit a variety of Army weapons and employ interchangeable reticules so users can move between weapons systems. While Soldiers can see targeting lasers and aiming lights with the naked eye, the thermal sights cannot. However, those targeting aids are visible with the ENVG Enhanced Night Vision Goggle, which fuses both infrared and thermal images. Sgt. 1st Class Lang Gureckis, who has served 26 months in Iraq and 9 months in Afghanistan, said devices like the ENVG add greatly to mission capability. "In Afghanistan it made a big difference," he said. "You can sit there on a mountain top ... and actually, if you can see a heat source a kilometer or a kilometer and a half away ... you can scan, as opposed to looking with night vision where you are only going to see somebody when they are like 200-300 meters away from you. It makes life a whole lot easier. We use the lightweight thermal weapons sights to the same effect. You can see far distances with them and actually tell what you're looking at, whether it is a guy with an AK47 or a guy with a blanket around his shoulders." There are plans to enhance the ENVG with improved image processing capability and also to include the ability to import and export digital information, such as data files and maps. The ENVGs are currently fielded to units in both Iraq and Afghanistan.